mwe3: Can you tell us where youre from originally and where you live now and what you like best about it? Ryan Carraher: I grew up in northern New Jersey and I moved up to Boston to study at Berklee and have lived there ever since. I really like the accessibility and history that is found in Boston. Also, there is a very supportive and diverse music scene which really inspires me. mwe3: Tell us about writing and recording Vocturnal. When was the album written and recorded and who plays with you on the CD and what is the chemistry like between you and your band? 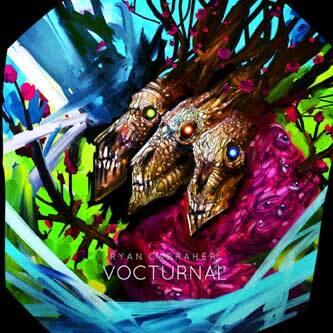 Ryan Carraher: Vocturnal was written periodically throughout my years at Berklee College of Music and it was recorded in November of 2015, a few months before I graduated. In many ways, this record represents my musical mind expanding and exploring various textures and ideas I discovered while working at Berklee. It was a way for me to express new ideas and explore new sounds I was inspired by. I am very lucky to have such an amazing group of musicians playing with me on this record. On drums we have Steve Wilkinson, on sax Brandon Wilkins, on bass Greg Toro and on keys Evan Waaraama. There is great chemistry between all of us for sure. All of these guys are extraordinary players and extremely creative people so they breathed life in to these tunes and absolutely gave each tune a vibe of its own. mwe3: Tell us about some of your musical influences as you mention that Vocturnal was greatly influenced by 20th century classical composers including Igor Stravinsky. How about other jazz and guitar influences that permeate the album? Ryan Carraher: I have always been interested in so many different kinds of music. I have spent so much time studying classic rock, prog rock, metal, jazz, fusion, classical etc. On Vocturnal a lot of the harmonic language and compositional technique is certainly inspired by 20th century composers like Stravinsky, Bartok and Messiaen. 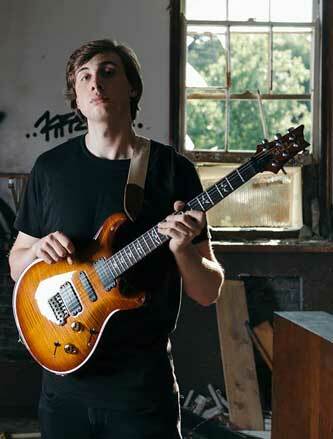 In terms of the jazz guitar influences my biggest one is Allan Holdsworth. He is certainly a player that understands and embraces his own musical voice to create something fresh and new and that is my goal as well. 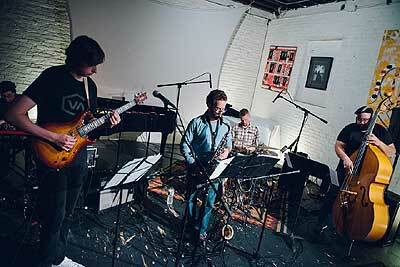 I am also a huge fan of Ben Monder, Mike Moreno, Bill Frisell, Kurt Rosenwinkel and Tim Miller. mwe3: How long have you been playing the guitar and tell us about the guitars and amps and effect that you recorded the Vocturnal CD with? Are there any acoustic guitars on the CD as well? Ryan Carraher: I have been playing for 11 years now. On Vocturnal the main guitar I used was my Paul Reed Smith 513. This guitar has been my main workhorse over the past few years and it resonates extremely well with me. I also used my custom Palir Titan on a few tracks, another amazing guitar. In terms of amps I used a Fractal Audio Axe-Fx Ultra for the whole album, I actually just went direct into the board with it. I used some of the delay and chorus effects within the Axe-Fx on the record but live I often use an Electro-Harmonix HOG2, Earthquaker Devices Rainbow Machine, Srtymon Big Sky and a Red Panda Particle. These will all certainly be making an appearance on my next release. mwe3: How do you stay in shape as a guitarist and composer? Are there exercises that you do to keep your fretboard skills in peak form and how about compositional studies? Do you practice a lot and do you challenge yourself as a composer? Ryan Carraher: I always make a point of practicing slow which keeps my fretboard knowledge up to snuff. I find that I can really focus on how things sound and find new pathways through scales and harmonic materials when I practice very slow. I also do a lot of free improvisation trying to bypass any expectations I may impose on myself and simply try to play what I hear. In terms of composition, I do like to challenge myself often by limiting myself. For example, Ill limit myself to a single harmonic source such as a scale, a melodic fragment, a tone row, an intervallic sketch... and see what I can create within these parameters. mwe3: What was it like studying at Berklee and did you choose a major to study or did you choose to go through the program for a degree? Ryan Carraher: At Berklee I worked with some amazing teachers that really worked with me to discover my own musical voice. It was a very demanding 4 years but definitely very musically worthwhile. I majored in guitar performance. mwe3: What was it like working with co-producer Keith Asack and what did he bring to the mixing and mastering of the album as well? Ryan Carraher: Working with Keith was great. All of us in the band are perfectionists and so is Keith so he certainly kept us on our toes. We recorded the album live and even if one little thing was off we would be back in the live room to do another take. He really gave us the opportunity to listen to ourselves and how we sound individually and, more importantly, as a group. mwe3: How about the cover art for Vocturnal? It seems humorous yet quite scary at the same time. And how did you choose the title for the album and how does the title fit the music? Ryan Carraher: The album cover certainly doesnt scream jazz! That was a conscious choice on my part. I believe the music and even the tones used on the record have a dark undertone and the cover certainly has dark and abstract features to reflect that. The name Vocturnal is a combination of the words Voyage and Nocturnal. Most of these songs were written at night and do have a dark vibe so it seemed to fit the music appropriately but in an abstract way. mwe3: With Vocturnal out in 2016 have you been playing concerts and have you given thought yet as to what musical direction youd like to go in next and what kind of album youd like to produce as a follow up to Vocturnal in early 2017? Ryan Carraher: We have been playing constantly since the album came out in March 2016. It has been great fun and we have been meeting and playing with some inspiring and humbling people. I am hard at work at a follow up to Vocturnal. It is definitely a different musical direction than Vocturnal. There are larger instrumentations, more exploration of 20th century composition techniques as well as a greater emphasis on collective improvisation, aleatoric devices and musical symbolism. I am looking forward to getting in the studio sometime in 2017.